0 Comments Published by Jane on Sunday, January 04, 2009 at 4:15 PM. 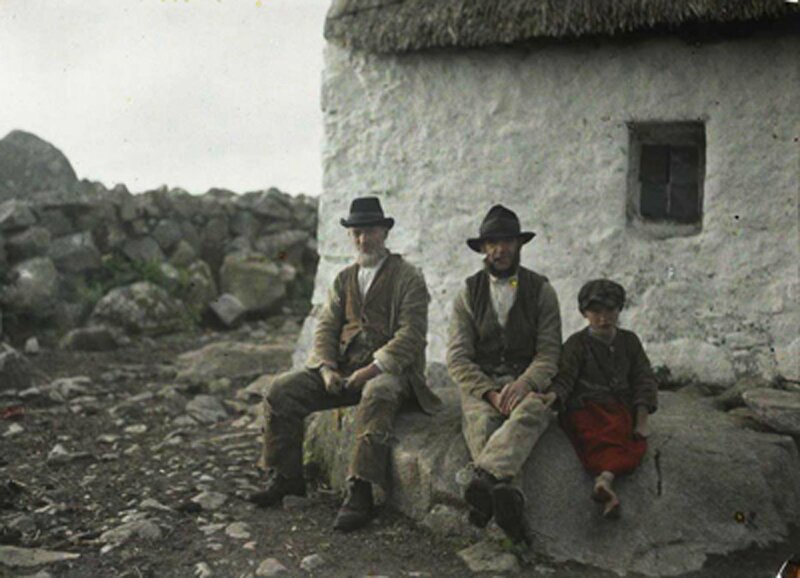 An article in the Boston Globe: Twilight of the color photo brought to my attention a series of color photographs of Ireland taken in 1913 and housed in the Musée Albert Kahn in Paris. A little searching revealed that the photos are currently on exhibit in Ireland: In Search of Ireland, 1913. Five of the photographs can be seen here: In search of Ireland. Here is the description for the photograph above: Two fishermen characteristic of the west coast, gentle, pleasant and hardened to poverty. They love Ireland with a passion, I would say, with lyricism as they all speak poetically. But what surprises most is their openness and their great interest in everything. The boy is dressed in a skirt which is common in the region for all boys up to the age of 12. Interesting that my great-grandfather likely wore a skirt as a young boy.